We don't have the time to debate the truth of the Bible from every single angle, including all the epistemology and philosophical discussions out there. There never is enough time in the world to get into everything about what is truth. But, we do have time to run through some very practical, everyday, common sense, tests of truth. These are some things that you use everyday in your life, things that you do all the time, and they serve you well. So, let's go through some of these tests of truth and see where you stand when it comes to the Bible. Let's discover the truth. Are you ready? Let's talk about first things first. How do we know something is true? First of all, to start we need to consider whether it was true in regards to past events, because past truth matters. If you doubt me, I just want you to ask anybody who ever took this product — cocaine toothache drops. Cocaine toothache drops. Great for the kids! This product comes from all the way back in 1885. 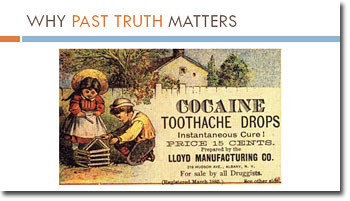 When we look through advertising from this era, we find out that cocaine actually was used in a lot of different products until about 1914 when it started to be pulled. According to one manufacturer, cocaine could make the coward brave, the silent eloquent, and render the sufferer insensitive to pain. That's great! But, we now know just a little bit more about cocaine. We know that it might not be the best substance for us. It has a lot of dangers to it. It is highly addictive, and it is something that we should not be giving in place of Tylenol. 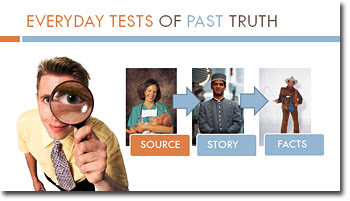 Can we trust the Bible's claims about the past? If so, we will have to take those teachings seriously if they're true. If not, we can safely dismiss the book as just another great piece of literature that really has no bearing on our lives today. Now, I've spent very little time in the state of Texas. Most of what I know about Texas and its people comes not from first-hand knowledge, but I hear good things and so I conclude that they are probably true. I believe that Texans love their football. I believe that Dallas is sometimes called the "Big D". I believe that I should be able to get some good barbeque or Tex-Mex somewhere within a one mile radius of wherever I'm standing. I have heard those things. I believe those things and I believe them because somebody told me. People told me these things. Whether these are from friends or whether it is from magazine authors or people who are on TV who have showed them off, I believe these things because people told me. Now, I don't believe everything that I have ever been told, but I recognize that if the source is trustworthy, then I'm going to accept what they say as truth. What happens when I apply this test to the Bible? 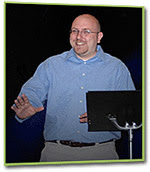 Does it show me that my sources related to the Bible are trustworthy when it comes to the past truth that is out there? And in a word — yes! I find out a lot of different things. I start looking at it, and do you know what? The source has remained intact. If the Bible were a lie, I'd expect it to have been modified somewhere along the way. Instead, when I look at the Bible, I find that the Bible I have is the same as what they had all they way back to when it was originally written. The process for figuring this out is pretty simple. We know that something that was written way back in ancient history, well, they didn't have Xerox machines to make copies to be passed down. So, to figure out if some Scripture that I am holding today is an accurate representation of what it said way back when, then all I have to do is figure out when this was originally written. I figure out when my earliest copy originated, then next figure our how many copies I have, and finally I cross check it. Okay, fair enough, things get destroyed along the way. People lose them, they misfile them, they burn them up, whatever. But, when we find out that there are seven copies of that manuscript which we cross check, we can then look at those and conclude, "Those seem pretty consistent, so we are pretty confident that what we have now is the same thing as Plato wrote back then." We do that with all the other texts from the ancient world, too. We compare copies of the writings of Caesar, the writings of Aristotle, and many others. Most of these copies have gaps of 500 or more years from the original writing to the copies preserved today. We still have those handful of copies that we look at and can compare with to conclude, "Yes, that is trustworthy." Billy...I did get you wrong. I hear you loud and clear.